Transistors using one electron at a time. Seemingly transparent sunscreens made with titanium dioxide particles that block harmful UV rays. Nanometer-sized specks of gold that change color to red and melt at 750°C instead of 1,064°C. Nanotechnology finds the unique properties of things at the nanometer scale and then puts them to use! Although nanotechnology is a hot topic with a wide range of fascinating applications, the search for a true introductory popular resource usually comes up cold. 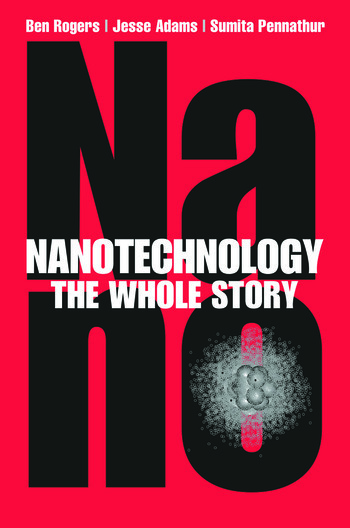 Closer to a popular science book than a high-level treatise, Nanotechnology: The Whole Story works from the ground up to provide a detailed yet accessible introduction to one of the world’s fastest growing fields. Dive headlong into nanotechnology! Tackling the eight main disciplines—nanomaterials, nanomechanics, nanoelectronics, nanoscale heat transfer, nanophotonics, nanoscale fluid mechanics, nanobiotechnology, and nanomedicine—this book explains what’s different at the nanoscale, and how we exploit those differences to make useful things. You’re holding the key to an exciting and rapidly evolving field. Ben Rogers is a writer and an engineer (BS 2001; MS 2002, University of Nevada, Reno). He has done research at Nanogen, the Oak Ridge National Laboratory, and NASA’s Jet Propulsion Laboratory, and published many technical papers, as well as fictional works and essays (which can be found at http://www.readrogers.com). He is currently the principal engineer at NevadaNano. Jesse Adams (BS 1996, University of Nevada; MS 1997 and PhD 2001, Stanford University) is the vice president and CTO of NevadaNano. He is working to bring multifunctional microsensor technology to the chemical sensing market space. Sumita Pennathur is currently an associate professor of mechanical engineering at the University of California, Santa Barbara (BS 2000, MS 2001, Massachusetts Institute of Technology; PhD 2005, Stanford University). She has been actively contributing to the fields of nanofluidics and nanoelectromechanical systems (NEMS), and was awarded both a Presidential Early Career Award for Science and Engineering (PECASE) in 2011, and well as a DARPA Young Faculty Award in 2008. "…an excellent resource for anyone interested in nanotechnology. …Summing Up: Highly recommended. Students of all levels, researchers/faculty, and professionals."